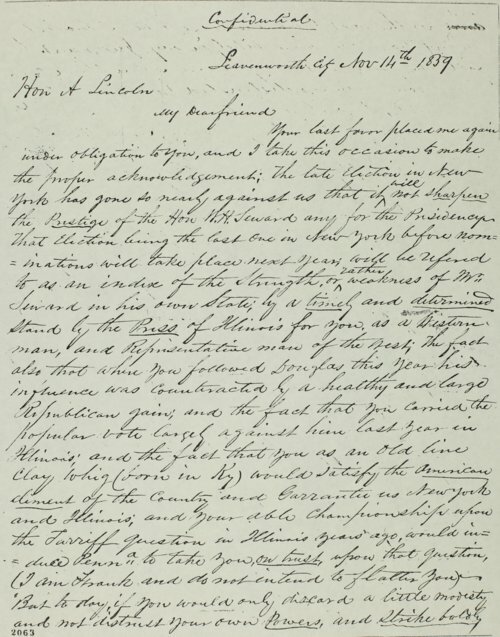 Mark W. Delahay wrote from Leavenworth City, Kansas Territory, to Abraham Lincoln. Delahay offered his opinions on Lincoln's chances for the Republican nomination for president in 1860. Delahay told Lincoln that he likely could convince Kansas Republicans to support his (Lincoln's) candidacy, especially if Lincoln would agree to visit Kansas Territory during the campaign. The letter is marked "Confidential."